The Reformation is over. Kinda. 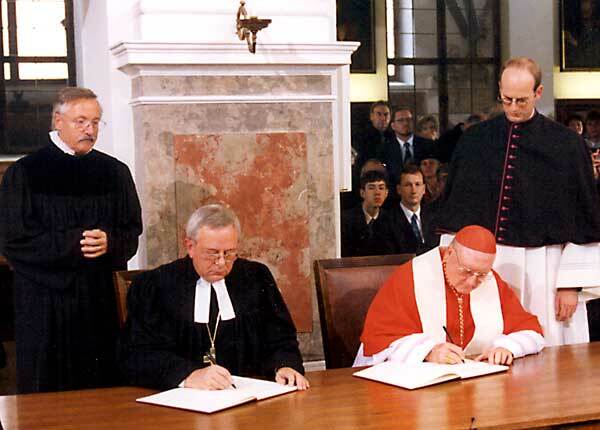 sign the Joint Declaration on the Doctrine of Justification, 1999. It’s been nearly 500 years since the split of the Church in the west, which was started largely by Martin Luther and his claim of salvation being obtained only through faith alone. Unfortunately, this split the Church and many other doctrines were changed by the Protestant Reformers before long. But the good news is that there is finally some hope for reunification again! This is going to take a loooonnnnggg time, but the most critical issue, the one mentioned in the quote above, has been resolved! The Lutheran bishops and the Catholic Church made a Joint Declaration on the Doctrine of Justification in 1999, and even the World Methodist Council adopted it as well in 2006. There is still quite a bit in the way of the complete reunification of the churches in the West, but this is a very important and exciting first step that resolves the most critical issue! The present Joint Declaration has this intention: namely, to show that on the basis of their dialogue the subscribing Lutheran churches and the Roman Catholic Church are now able to articulate a common understanding of our justification by God’s grace through faith in Christ. We confess together that all persons depend completely on the saving grace of God for their salvation. We confess together that God forgives sin by grace and at the same time frees human beings from sin’s enslaving power and imparts the gift of new life in Christ. We confess together that sinners are justified by faith in the saving action of God in Christ. By the action of the Holy Spirit in baptism, they are granted the gift of salvation, which lays the basis for the whole Christian life. We confess together that in baptism the Holy Spirit unites one with Christ, justifies, and truly renews the person. But the justified must all through life constantly look to God’s unconditional justifying grace. They also are continuously exposed to the power of sin still pressing its attacks (cf. Rom 6:12-14) and are not exempt from a lifelong struggle against the contradiction to God within the selfish desires of the old Adam (cf. Gal 5:16; Rom 7:7-10). The justified also must ask God daily for forgiveness as in the Lord’s Prayer (Mt. 6:12; 1 Jn 1:9), are ever again called to conversion and penance, and are ever again granted forgiveness. We confess together that persons are justified by faith in the gospel “apart from works prescribed by the law” (Rom 3:28). Christ has fulfilled the law and by his death and resurrection has overcome it as a way to salvation. We also confess that God’s commandments retain their validity for the justified and that Christ has by his teaching and example expressed God’s will which is a standard for the conduct of the justified also. We confess together that good works – a Christian life lived in faith, hope and love – follow justification and are its fruits. The understanding of the doctrine of justification set forth in this Declaration shows that a consensus in basic truths of the doctrine of justification exists between Lutherans and Catholics.